Welcome To Our Interactive Journal! Send Us Your Thoughts - It's Much More Fun That Way! To contact us with any questions or comments regarding our Journal entries or any part of this website, Click Here. Today I finished up a golf tournament that started on Thursday. I was an invited guest for a Member-Guest tournament. We played a little below average and our competition seemed to play their best in matches against us, so we did not fair well. But it has been a gorgeous weekend and we had a good time. With all the thoughts of golf, I have really been thinking about developing some type of golf netword for RVers. I know the Good Sam Club promotes a golf card, but I am thinking of something a little more personal where RVers that belong to clubs or courses across the country might be willing to host other RVers that may be in the area. I have a few other ideas as well. I think I will post a couple of inquiries on the RV forums to see if there is enough interest for a couple of concepts. This evening I started a new book that was recommended to Linda by a friend. It is called "The Unmistakable Touch Of Grace" by Cheryl Richardson. I got through the first chapter, and she talks about recognizing moments in your life that may send you in a direction for living a bigger, more fulfilled life. Since what I have read so far speaks to the type of awareness Linda and I have discovered over the last year or so, I have a feeling I will add this book to my recommended list. Though this website is designed to provide information to those considering full-time RVing, the deeper purpose for me is to perhaps be a catalyst for life changes. We hope someday that folks will let Linda and I know that our website, experiences, or face to face meetings somehow were a recognized "touch of grace" in their lives. After pondering various events and moments in our lives, it is clear we have had many "touches of grace" that we happened to recognize and act upon. We are looking forward to more. Here's hoping that we all are open to them when they occur. Happy Father's Day to all the wonderful Dad's out there. Just wanted to start the day with that message. I played golf this morning and found that many of the country club members we invited to the party are coming. These are folks that we have only known about two years, but have been very nice to us as newcomers into their world. We are looking forward to having them at the party and staying in touch. In the afternoon, we took my Dad and Mom to dinner. He wanted to go to the Stephen Foster Restaurant in Bardstown, KY. Bardstown is a historical little town about a half hour away. The restaurant was an all you can eat buffet of country cooking and cost about $30 for four of us. The food was good, but it was not the kind of place people on Weight Watchers should be going. Our willpower was not very good. But Dad enjoyed it and we got him back home for his favorite show - 60 Minutes. All in all it was a pretty laid back day and Linda and I finished the day off with a board game and some reading. Now back to another week of work and getting ready for our road trip to Florida next weekend. Work is crazy and my entire Louisville staff is frazzled. I have intentionally kept staff tight knowing we would be going into a merger with another operation. It has also caused Linda and I to jump in with both feet, and it is taking a toll on us as well. I was hoping we could just be in the position of providing support and slide out gracefully in our last month. Instead we are right in the thick of things and working too many hours with too much stress. Hopefully, we can hang in there for one more month. Monday night we had another little grill out for a couple of friends from high school. One of them will be unable to attend our party, so we wanted to get together with him before we leave town. It was another great evening. Tuesday and Wednesday were rather uneventful outside work. Thursday we picked up a small 4" X 8" U-Haul trailer and loaded up the remainder of our belongings that did not make the cut to be in the RV. The big truck hardly even notices this little trailer, even fully loaded, is back there. Friday after work, we will start our whirlwind trip to Jacksonville to Linda's sister's to store some some items and to outright give her some items. We will return on Monday, so we will drive 11 hours each way between Friday night and Monday night. We are not looking forward to the drive, but we are looking forward to the final distribution of our remaining stuff. No more packing and hauling for a long, long time. When we return on Monday, we will have just about one month to go. We are soooooo ready!! We finally got out of Louisville about 8:00 pm. We were not optimistic about getting very far - maybe Knoxville, Tennessee four hours away. After stopping for a bite in Corbin, KY (the birthplace of Kentucky Fried Chicken for anyone who cares), Linda took over and I decided to get some sleep. I had a goal of getting to Asheville, North Carolina before turning in, but I was still thinking maybe Knoxville by midnight. I was able to get a little sleep between the bone jarring bumps on our fine interstate highways, and I woke up for good as Linda was just about to actually make it into Asheville around 2:30 am Saturday. We pulled into a hotel only to find that they were full. As we were getting back into the truck, a busload of partiers was arriving back at the hotel. One guy, for who knows what reason, slapped the side of our truck hard. I was out the door yelling in a heartbeat before I realized that this was not a time to confront 50 or so drunks. A cooler head prevailed and we left quickly. After hitting another hotel with no vacancy, we got back on the highway. Ultimately, we pulled off the interstate four more times only to find several more hotels with no rooms. We finally found one bed in a place called Newberry, South Carolina several miles and hours after we left Asheville. That's right, we paid for a room for the night when the night was already over at 5:00 am Saturday morning. But we were glad to be able to get a few hours sleep and the opportunity for a shower before we headed on. With today marking the beginning of our 26th week, I guess we are just about to the half year point since we started the journal. Four more weeks and we will be on the road. After getting a little more than three hours of sleep, we were up, showered, fed, and back on the road. We had gotten a lot further Friday than we ever thought we would, but our number of stops to find a room has really thrown off our timing and sleep pattern. Just as we crossed into Florida, I got a phone call from my buddy Jeff. "How's Florida?" he asked. He said he knew we were in Florida from reading the journal, and he was only calling to get his name in today's entry. So Jeff, as promised, you made the journal. It took us twenty-one hours to make an eleven hour trip, and we could only chalk up about six hours to our food, gas, and our brief hotel stops. Apparently, we lost four hours in the twilight zone. Anyway, we made it to Linda's sister's (Karen) house and unloaded the U-Haul. I returned the U-Haul to a Jacksonville location. Once I got back to Karen's, she had prepared a wonderful dinner and then we chatted for awhile. Linda and Karen then started going through the boxes and bins while I have been making this journal entry. But now it is midnight, and my eyelids are getting very heavy. Good night and we will be back with an update tomorrow. Today we were able to have a leisurely breakfast and just chat for a while with Linda's sister Karen. Somehow we got onto our Saturday morning Waffle House breakfast. For those of you not familiar with Waffle House, these are little rectangular, yellow restaurants mostly in the south located at just about every interstate exchange. Now I thought everyone knew about Waffle House, but apparently they are only in about half the states. Every Waffle House is identical and they are unique in that the cooking, the dishwashing, and the employee sniping goes on right in front of you. The food is not top notch, but it suffices for a hearty breakfast or late night alcohol induced binge. And the other interesting thing is that the cooks never have anything order-wise to look at. The servers call out the orders, the cooks are supposed to repeat it back, and then they do everything from memory. Linda and I relayed to Karen our typical Waffle House experience. We don't even know why we go there because we are always stressed out when we leave. There is so much going on and all the employees seem under a tremendous amount of pressure during busy times. And they don't hold back yelling at each other, making fun of each other, and generally not caring what the customers may think about all this. It is a wonder anyone ever gets the right order. Anyway, the idea came to us that I might need to write a book - The Waffle House Chronicles or something like that - telling the stories of individual Waffle House experiences as we travel. I'm thinking that it could be pretty darn funny and from what I have seen on the internet, it looks like there could be plenty of contributors. Another crazy idea to make a little cash. If only I could harness all the ideas and get someone else to do the work. Later we went to a small park in the Jacksonville Beach area. It was in the middle of residential neighborhoods, but you had to know it was there to find it. It was how northeastern Florida used to look before all the development, with trees and palmettos and water filled with fish and turtles. As we finished walking through we ran into an elderly gentleman who was carrying several bags. We stopped to talk to him for a minute and found that he brings peanuts and bread and popcorn to the park to feed the squirrels, the birds, the fish, and the turtles. On the way back to the car, it struck me that I should have gotten some photos of this man with his little dachsund. Note to self: take photos of interesting characters and keep a notepad in the camera bag to record information to go with the photos. I'll catch on to this new life eventually. That evening we went to Karen's daughter's house for a pot luck dinner and a few hours of karaoke with the whole family. A good time was had by all, before we had to leave and get some rest for the long Monday journey. We were on the road by 6:00 am. After driving until about 10:00 am, we stopped for a break in South Carolina at the RV friendly Cracker Barrel for some breakfast. Afterward, Linda took the wheel because the cell phone calls and emails were starting to come in from work. I don't know what would have stressed her out more - having to deal with work issues as a passenger or watching me try to drive, talk on the phone and answer emails at the same time. She decided it was best for her to just drive and leave my hands and brain free to just deal with work. So she drove the next several hours with a break at a rest area in the North Carolina mountains and with two quick hops off the highway in Tennessee to visit the one Escapees park in the state and a Good Sam park at the next exit. The people were very friendly at both parks, but they were both way too close to the interstate for us. Linda then continued to drive until we made our last stop for gas and food in southeastern Kentucky. With our dual gas tanks it was nice to only have to stop once on the way down and once on the way back for fuel. But man were those stops expensive with diesel between 2.19 and 2.25 a gallon. And driving 1600 miles in four days is not my idea of fun. The F450 got 14.7 mpg pulling the smallest U-Haul trailer and 15.8 mpg without it. But we have no more stuff to haul around or store. And we were home before dark at 8:30. That's much better. Twelve and a half hours including breaks, gas, and two sit down meals. I still don't know what happened to the extra hours on the first leg of the trip. One girlfriend of Linda suggested alien abduction - I don't think so, but if the Enquirer is desperate for a story, we can accomodate. Upon arriving home, we wished Dad a happy 83rd birthday. For all he does, you would never know he is 83. He is still very active, just a little slower getting it all done. Happy Birthday Dad! Today was mostly about work, but I don't want to talk about it. So briefly we will just say that we now have over 100 people that are coming to our party. I expect that to swell by at least another 50 by the end of next week. It is going to be lots of fun and we really look forward to seeing everyone. Also, we are starting to re-work our intitial few months on the road. Narrowing down where we are going to be and when is a tough chore. Also, trying to select campgrounds is no easy task. We have six different campground directories and the internet. But no where can I find a summary of campgrounds that have full hook-ups, with room for a forty foot fifth wheel, with beautiful scenery, miles away from noise and interstate, with roads wide enough to get to them, with a clear view of the southern sky for my satellite. When that directory comes out, I'm buying it. After a few nights of searching, I finally settled on our first campground. You see the first thing we are going to do is is go to Winchester, Kentucky where the real estate company I have done business with the last few years has a company golf scramble and party the first Saturday in August. These folks are a great group of people and we have had lots of fun working together over the past few years. We will stay three or four days before we head to Chattanooga, Tennessee for some RV warranty repairs. The problem with Winchester is there are no campgrounds in the area. It is just outside of Lexington, Kentucky where there is supposedly a nice campground at the Kentucky Horse Park. But we wanted to be a little closer. Finally, I discovered that the Fort Boonesborough State Park campground on the Kentucky River is only seven miles from the Winchester Country Club. So, even though it has water and electric only and likely will have very small spaces (because it is a state park), that will be our first base away from Louisville. Can't wait. The first thing this morning my Mom knocked on the door and told me to grab my camera. Apparently there was a deer in one of the flower beds. 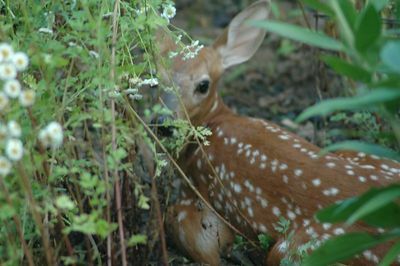 Well, I was quite suprised to find a small fawn, with its youthful spots and everything, lying in her flower bed just a few feet from the house. I was trying to get close enough to get a good shot without startling it. This was the best one I got. This was just the sort of exciting, yet calming start to the day I needed. With it being the last day of the month in a real estate closing office and being short staffed and with the prospect of employees having to move to another office on Friday, I did not expect to have a peaceful day. But the little fawn helped me realize that in less than a month, we will have numerous opportunities to witness such wonders of nature. The day was as bad as expected with us learning that one of our employees had a death in the family. This was the second unexpected death this week of a close family member of our staff requiring out of state travel. Our thoughts and prayers are with both families. Our remaining staff, with two shocking absences in route elsewhere, trudged on and did yeomans work in just getting through the day. They are so dedicated and always come through in tough situations. It will be very tough saying goodbye to all of them. I'm tearing up just thinking about it, so I'll just leave it at that for tonight. I think our little fawn showed up for a reason today. On to tomorrow. Often the day after the last day of the month is just as hectic as the last day of the month. The deals that didn't get done yesterday all want to go today. Plus this "day after end of month" was even worse because it is a Friday and the day before a three day weekend when people really like to move. On top of that, my Louisville employees were moving to their new location. Since the timing of the move was not good, and the move was not planned very well, the day seemed to be nothing but chaos and high emotions. By the end of the day, everyone was spent. Linda and I quickly decided we were heading home earlier than we had in a while and that there would be no talk or thoughts of work this weekend. Before the day ended, I took our Ohio RV title to the county clerk's office to get our Kentucky title and plates. I stepped into the office and took number 67, then looked at the "now serving" sign which showed 46. Oh boy. They did get to me pretty quickly, however. But then I had trouble explaining to the clerk that I needed to title my RV. "Have you had the sheriff's office inspect it?" No, there is nothing anywhere that says I need a sheriff's inspection. "All motor vehicles need to be inspected to be licensed in Kentucky." I understand, but it is not a motor vehicle. "I thought you said it was an RV." It is, but it is a fifth wheel trailer - no motor. "When I hear RV I think of motorhomes." That's nice, but it is an RV, and it is not a motorhome. "Oh well then, have you had a fire inspection?" What? "Pull behind trailers have to have a fire inspection to be licensed in Kentucky." Look, I am a research nut, and no where on the internet, no where in your literature, and no where in the conversation with another clerk on the phone before I came in here was it ever mentioned that a fire inspection was required. "I'm sorry sir. Here is the name and phone number of an inspector. Once the inspection is complete, all your paperwork is in order, so just bring it back to me and we can have you fixed up in about five minutes." Having my head explode in little tiny pieces was not going to help anyone, so I cowered away. I called the fire inspector place. When can I have someone come out and inspect my RV? "Sir, that department is overloaded with everyone coming in for the holiday weekend, and besides, they don't come to you." Let me see if I have this straight. I have to bring the RV to you and there is no one I can talk to because everyone in the county has come in for fire inspections to get licenses a few hours before they go on vacation? Oh, okay. Do you think I could pay extra to have someone come to us? "I don't know sir, I will have the lady that runs that area call you." Well, now I am thinking that retaining this Kentucky domicile thing was a really bad idea. For 2006, it may be South Dakota, here we come. Once at home, Linda quickly poured herself a glass of wine and we hung out with my parents on their front porch for a long time. We talked about the emotions of having us so close by for three months and then us leaving. We talked about how they were struggling to keep up with their seven acres at ages 73 and 83, and how it might be time to sell the homestead and downsize. And Linda and I pondered whether any of our future campsites would be as nice as it is here with the birds and the trees and the quiet. So, after an emotional day it turned out to be kind of an emotional evening as well. But at least we were relaxed and not thinking about what had to be done on Tuesday. It was a gorgeous day. I played golf early and Linda helped Mom in the yard. After golf I got a haircut. I am keeping my hair, at least what hasn't receded or dropped out, very short. My stylist (like my hair has a style) says that Linda can cut my hair, and I just needed to go to Wal-Mart to get an electric clipper set with certain guards. So I went to Wal-Mart and picked up a 30 piece set for about $25. It even came with a "How to" DVD and a barber cape. I can see Linda cutting my hair at the campground, and guys lining up for a buzz of their own. Hmmmm - we could be on to another revenue generator. When I got home, Mom informed me that a neighbor had just dropped off about 20 pounds of freshly caught, cleaned, and fileted catfish. The question was whether we were up for a fried catfish dinner. I knew my answer and when I asked Linda, the response was a little more emphatic - "Heck Yeah!" or something close to that. A great dinner followed by cherry pie ala mode (don't tell Weight Watchers) was a good capper to the evening. Linda and I tried to read a little, but were asleep in minutes. Except for the late night fireworks, it was a peaceful evening. It was another pretty day, but much hotter. I played golf early and Linda helped Mom in the yard again. Then Linda met me at the country club for brunch and we went shopping. She said she needed cooler clothes or she was going to die in the heat. I needed some more camping clothes as well so, we spent a couple of hours making our wardrobes more casual, more comfortable, and cooler. Linda was having trouble staying focused on the goal. "This is cute. This would be a good outfit for ...." Fortunately, the prices knocked her back into our budget reality and our lack of need for "going out" fashion. Once back home, Linda concocted a new frozen drink to cool us off. She used her Smoothie Machine and Mountain Berry flavored Kool-Aid with a touch of Absolut Raspberry Vodka. She called it a Raspberry Mountain Freeze. It was a cool, sweet, refreshing mid-day drink that we sipped while we sat back in our wonderful reclining lounge chairs under the trees reading. We were about as relaxed as we have been in quite some time, and even cat-napped in between chapters. We read into the early evening until it was time to eat something. Once the mosquitos chased us inside, we continued to read into the night. I finally finished "The Unmistakable Touch Of Grace" by Cheryl Richardson. The book relates how Cheryl went from going no where to becoming a life coach, author, and co-host of Oprah Winfrey's Lifestyle Makeover Tour for a year. It talks about how caring for yourself spiritually and physically allows you to be open to grace and a more conscious existence. She goes on to say how her "success" made it hard for her to balance her life and how she had to back away - sounds familiar to us. For me, the book offered confirmation of what we are doing. We have gone through much of the life evaluation that the book is intended to spark. Ms. Richardson has already reached far more people than we ever will, but our message (and one of the reasons for this website) is basically the same - Become aware of your life, take care of yourself spiritually, and you will live with joy in your heart and become an agent for others to do the same. I hope that we all can take some time out to think about that a little. Have a great Independence Day! We are so thankful to live in America. Our celebration consisted of being together and cherishing the fact that we can do what we are about to do. We started the day hanging out inside with Linda reading and me taking some much needed time on website maintenance. I then revised our business card to include our Cambridge, a different picture of us, and changed the words to be more in line with our Home Page. We then printed about 200 hundred cards and placed them on business card magnets. We are going to give each family that attends our party a refrigerator magnet with our business card so they can keep us in mind and have no excuses to stay in touch. As it started getting hotter, we packed a cooler of bottled water and headed to the farm pond to fish for a while. We caught several bluegill which were slightly larger than the worms they ate. I did not have the camera with me, and it is a little hard to believe, but I actually caught two fish at the same time on the same hook. Strangest thing I have seen in a while. The best part was just relaxing and sitting in the shade enjoying our surroundings. Linda asked "So are you ready for this life?" Just in case we have not made it clear, WE CAN'T WAIT for the adventure to begin! After fishing we started working on a grilled barbecue rib dinner. 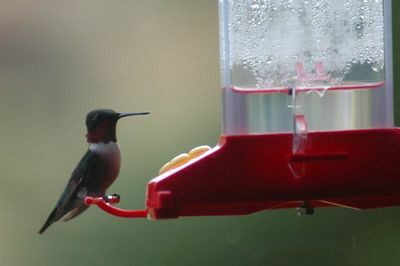 We have been trying to get close-up photos of the ruby-throated hummingbirds that frequent our feeders suction cupped to our windows. With the camera zoomed in so tight, it is very difficult not to move the camera and end up with a blurred shot. So I put my table top tripod that I got a couple of weeks ago to use, and Linda got this shot while cooking. Cute little guy, huh? These little marvels come to both our feeders all the time - so much so that we have started taking them for granted. We hope the continual movement once we get on the road will help keep us from taking such beauty for granted. After our wonderful rib dinner when it was cooler, my Dad mentioned that he was going back to the pond to try to catch some catfish. I took that as his very subtle way of asking me if I wanted to go. So, I grabbed the camera and my rod and fished with Dad until we ran out of bait. We didn't talk much - we never do - but it was a great moment before we leave this place. It wasn't your typical Fourth of July celebration, but it was an all-American celebration just the same. Hope yours was just as good. The first thing we learn is that another employee is undergoing tragic circumstances. Her father-in-law almost died over the weekend and they are not sure he will recover. What is going on? That's three family tragedies in a week - all in the same little department. And since Linda is the only one left in the office that knows that line of business, she has had to jump in with both feet this week doing the job of two other people. That leaves me doing the job we were doing together. So what should have been a relatively sedate last month of work has turned into a bit of a nightmare. I keep saying that everything is just confirmation that our decision to become full-timers is what we need to be doing at this time in our lives. Those second thoughts I use to have every day three months ago are completely gone. On the positive side, it looks like we are going to have a major Bon Voyage party. We have RSVPs for 213 people. We are just glad we got someone else to plan it - whew! Countdowns continue. Only 21 days until we are "retired" and 22 days to the party. Less than one month to our first overnight stay on the road. Yikes! There is still a lot that needs to be done - but we will make it happen. Thursday and Friday were still tough days at the office. But there are only 15 work days left. Thursday evening Linda attended her final meeting of the country club House Committee. The House Committee takes on the responsibilty of planning social events and assisting the general manager in monitoring what goes on at the club as it relates to the kitchen, catering, and clubhouse items. After the meeting, Linda and I had dinner with the Hirsch's. We had a wonderful dinner and discussed our upcoming plans in depth. They are another of the nice couples that have made us feel so welcome at the club in our short two year stay. It was nice to take our mind off the office. Friday evening we went back to the club for a Wine Tasting function and dinner. Now I am not a wine fan, but we learned a bit and had another nice experience with our friends. Standard Country Club is one of the four oldest established clubs in the country. It dates back to 1893 when it was established by a Jewish membership that was not allowed access to other clubs. It has remained a predominantly Jewish club but has an open membership. We are not Jewish, but it has never been an issue. In fact, we were members at another club and have felt welcomed at Standard far more than we did at the other club. For example, the first night we made reservations for a meal, we were greeted at the door by five couples who introduced themselves and invited us to join them for dinner. They have been special to us since that first night. We joined after playing the old traditional course and seeing that it was an excellent walking course (I love to walk when I play). Plus it only took us 12 minutes to get there from home or office. Our brief time at Standard has been very special and will be one of the toughest sacrifices that we will be making as we leave. If any of you wonderful Standard Country Club folks happen to read this, thank you for your kindness and friendship and we will miss you. Twenty-six days until we are on the road. I played golf in the morning, worked on getting our cell phone plans coordinated for the road, in the afternoon, took a nap, and headed back to the club for a pre-event party for my final golf event which will take place on Sunday. Afterwards, I helped my Mom download some virus protection and conned a piece of the cake she had made for Sunday's family reunion. Linda slept in. She then did laundry and finished "The Unmistakable Touch of Grace." Then she started reading a book we picked up long ago called "Earth Medicine." It is a book about Native American beliefs and how they viewed their connection with nature. Linda felt that it might now contain even deeper meaning for us. While I attended the party, she joined a girlfriend (Hi Joyce!) for dinner and a late movie. It was nice to just enjoy the company of others and relax today. Sunday morning I played in my last golf tournament as a country club member. We had a Pro-Member tournament in which our head pro lined up 20 other pros from around the state to play with member threesomes. As usual (in tournaments), I did not play well. But it was a good time and I enjoyed playing with our Pro, Scott Porter. Scott is the pro at The Bull Golf Club just southeast of Lexington and was the only pro in our little tournament to play in a major tournament - the 2003 PGA at Oak Hill. What a nice guy. And the bonus is that his course is only a few miles from our first stop in August. It looks like I may have my first tee time as a full-timer set up. When I got home, Linda and I went to a large family get together. It was the Payne side of the family and though I knew many of them, the percentage of people there that I knew that were younger than me was very, very small. It used to be that I was the one playing volleyball and softball and horseshoes. But I guess I am now one of the old people, since my activity consisted of filling my plate a few times and sitting under the tent. Afterward, we headed home and I worked on Mom's computer more. After spending hours waiting for it to boot and re-boot trying to get all the virus protections running, I shut the thing down from total frustration. At that point I decided that the old Gateway PC and Windows 98 operating system had to go. The purchase of a new system would provide for better performance and, regardless of the cost, would be worth my sanity. How many times do I have to say it. Technology! Sheesh. Early in the morning we dropped the F450 off for a little work. On the agenda was the installation of a bed liner, the addition of mud flaps to help keep the Cambridge clean, the tightening of the bumper (which almost fell off pulling the U-Haul to Florida), and the first oil change now that we have gone over the 5,000 mile mark. Just trying to squeeze in all the little touches before we leave. For both of us, work was still a drag but we finally started letting go and realizing that we could not do it all nor protect the people we are leaving behind. Linda decided that her last day was going to be July 22 - only two more weeks. I realized there is no way I am going to be able to leave things as clean as I wanted and can only do the best I can for the remaining time. A sadness is starting to creep in, but also some relief at the same time. We called it quits a little earlier than the last few weeks and went shopping. Linda had her eye on some new binoculars she spotted at Wild Birds Unlimited. They were a very nice pair of compact Swarovski pocket 8 X 20s. What clarity for such a small binocular! Yikes, what a price for such a small binocular! But I reasoned that this was one valuable accessory for our new life that was worth the cost. In fact, I was so impressed I asked about trading in our nice Eagle Optic Rangers to get a second pair of the Swarovski. They are so compact and light with such great clarity, they would be such a nice change from the bulkier, heavier models. After Wild Birds Unlimited, we hit Staples and bought the new desktop for Mom. Then we hit the nearest Laz-E-Boy store. We have not been happy with our RV recliners because of their poor quality and because they are so hot to sit in. So we found a small neutral color leather recliner on sale and quickly set up two for delivery. Leather (probably more leather-like) has a coolness about it to go with the comfort. Plus these recliners are very lightweight for easy handling when moving them into traveling position, they have an independent, removable back to get through the small fiver door, and they come with lifetime warranties. I'm not sure who was happier Monday evening - Mom with her new computer, Linda with her new binoculars, or me with the extremely important new recliners. All I do know is that financial planner Howard was cringing and shaking his head. We suppose he'll just have to get creative and figure out how to replace the cash on the road. The rest of us will just be happy with what may be our last little rush of instant gratification before the cash flow turns into a very slow drip in a couple of weeks. Wink. First thing this morning I went in for my last dentist appointment in Louisville. I have been going to the same dentist for 28 years. It was weird knowing that simply making an appointment and going to the dentist would never be the same again. Every six months I got a reminder, made a call, and went in a few weeks later. Now what will we do? When will we go? How will we choose a dentist? Will we be able to just call one up and go in? Will anyone see us since we will be new patients with no dental insurance (we are self insuring in this area)? I had thought about all this before, but this is real now. When will I go to the dentist again and what will it be like? Like I said - weird. After getting to the office, between keeping customers happy, I tried to get RV things done. I was still trying to get a fire inspector to come to the farm. I think I may pull that off - I just don't know when. I called the attorney we visited several weeks ago about our wills and living wills just to let him know we had to get things finalized. I called Shipps RV in Chattanooga just to confirm our appointment in August and make sure they had everything we needed repaired on their list. I called Fitzsimmons Awnings to make sure we were on schedule to bring our truck in on Thursday for the custom made bed cover they are making to go around the hitch. I sent out an email trying to get leads on anyone that might be interested in buying our car. Whew! I have faith that everything will come together, but each day we get closer to departure date there seems to be one little twinge of panic. I love that feeling - it's getting exciting! I'll pass on writing about the work days other than to say they are over. Linda has five more work days left and the same may go for me. Friday the 22nd will be the last day for both of us if my boss has no objection. Wednesday we picked up the truck from Star Ford here in Louisville. They removed my hitch and sprayed in a bed liner. It looks pretty good and will protect from scratches and rust. The charge was $275.00. They also tightened my bumper and did my first oil change at no charge. They did not have mud flaps in stock, so we will have to go back once more to have those installed. We then dropped the truck off Wednesday night at Fitzsimmons Awnings. James at Fitzsimmons agreed to design a waterproof bed cover that goes around the fifth wheel hitch while hooked up. We have heard that such a cover exists, but I have searched high and low without actually finding one. Thursday morning was Linda's last dentist visit in Louisville. She had not been going to this dentist very long, so her experience was not quite as weird as mine on Tuesday. Thursday afternoon we picked up the truck and checked out the new truck cover. I will get a picture up on the site - it is a fairly simple design. We will see how it works and see what other fifth wheelers think about it. I made sure James saved the pattern. Friday, Linda spent the first of two days at Joseph's Salon and Spa getting some "maintenance" done. She has been going there for years and has developed some long-time relationships. It was apparently very emotional for her. She said she cried even knowing she was going back on Saturday to see her hairstylist Trudy. The dentist, the hairstylist - these are things we didn't really think about as being that big a deal when we made our decision. They are not a big a deal in the overall picture, but it is surprising how much we take things for granted and the effect on us as we visit these places for the last time.